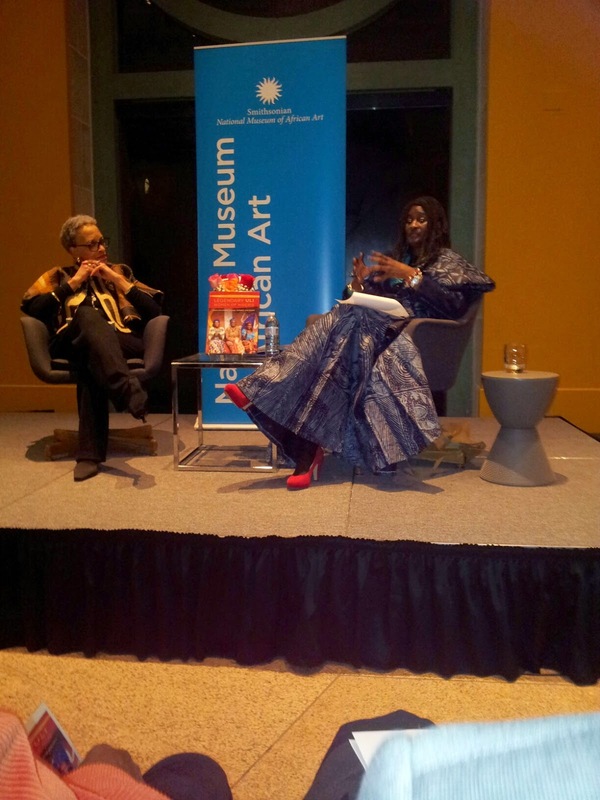 Smithsonian Nat'l Museum of African Art Director Dr. Johnnetta Cole and Ambassador Robin Renee Sanders @ February Black History launch of Sanders' book, "The Legendary Uli Women of Nigeria." 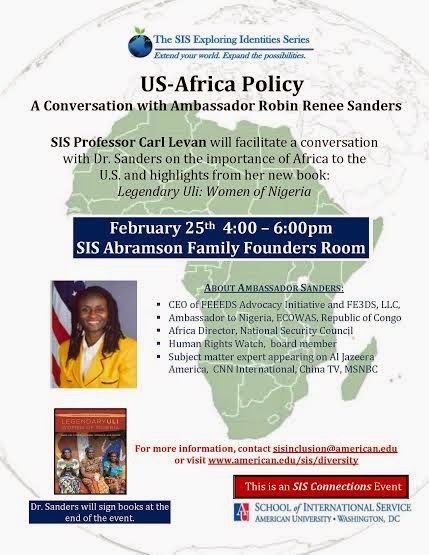 Ambassador Robin Sanders will be speaking on key Africa and national security issues at American University in Washington, D.C., February 25, 2015. The event is part of the School of International Studies program that focus on bringing in international affairs professionals to share their analyses and diplomatic experiences with the University's students. 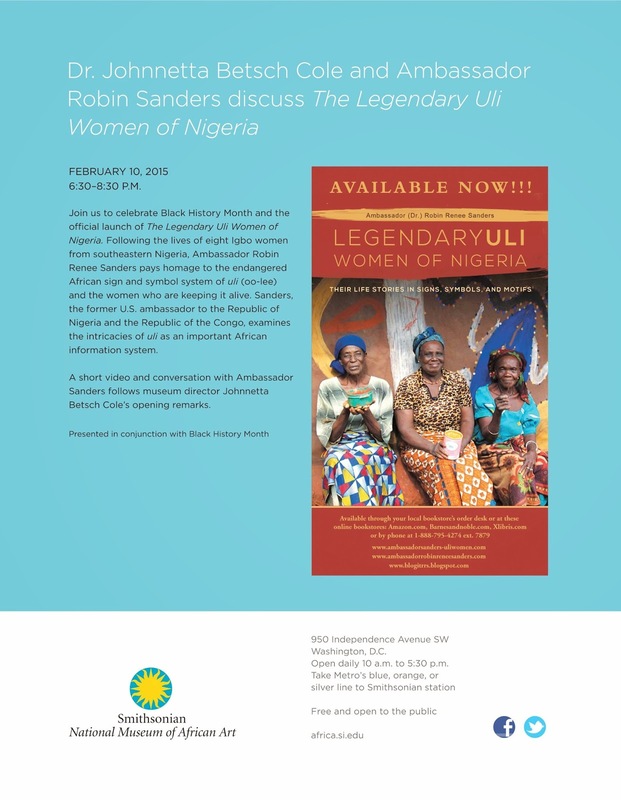 Her presentation will also be followed by a signing event of Sanders's book "The Legedary Uli Women of Nigeria." Having work on the run-up to Nigeria's 2011 election, Al Jazeera America and Al Jazeera English, interviewed Ambassador Robin Sanders, on her views on the recently postponed Nigerian 2015 elections. The issue of security in the North remains a challenge, but the postponement has embolden Boko Haram's self perception as attack in the North continue and now in addition to Borno, Yobe, and Adamara, Gombe has now been included in its regularly attacks from female suicide bombers to attacking and killing innocent villagers in the state. She notes that it is important to understand that the recently announced African Union Force of 7,500 could take from 4-6 months to stand up, while the regional military forces of Chad-Niger-Nigeria-Cameroon try to recapture territory and provide some stability in certain areas of the now four states affected. On Nigeria's election Commission, called INEC, Dr. Sanders gives them high praise, particularly its Chairman Jega who she worked with during the 2011 pre-election period, for doing everything possible to be administratively ready for the elections with nearly 70 percent of voter cards distributed to the 68.4 million registered voters. Ambassador Robin Sanders who worked with her team, INEC and other civil society organizations in the run up to Nigeria's 2011 elections, comments on the February 6, 2015 announcement postponement of Nigeria"s upcoming election which was scheduled for February 14, 2015. Sanders states in Al Jazeera interview that the decision to postpone was disappointing and shows to Boko Haram that it can affect national issues like presidential and legislative elections.